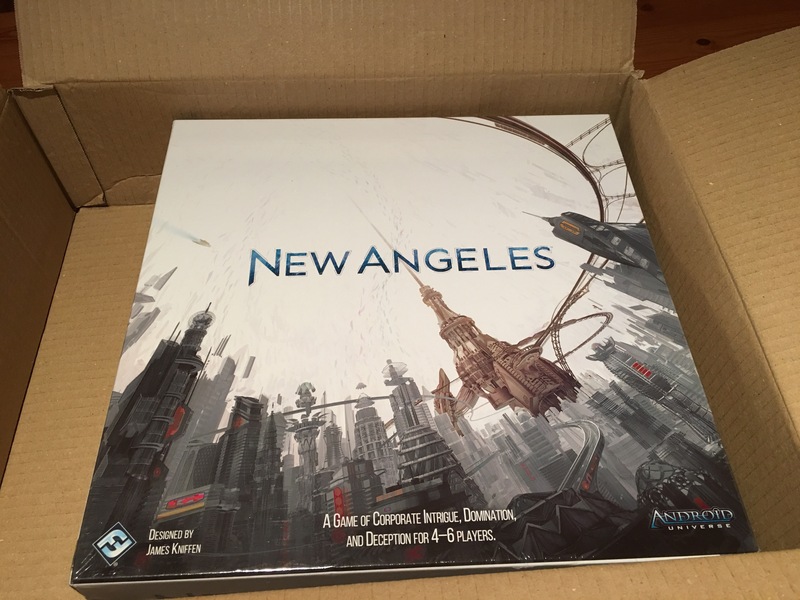 My copy of New Angeles has had a very roundabout route to get to me but it arrived a few days back and there was no doubt it would be played straight away on games night. Better still come the night come the players and we had a full compliment of six to test drive it. It’s semi coop with a POSSIBLE traitor in there which makes for a nice level of paranoia. 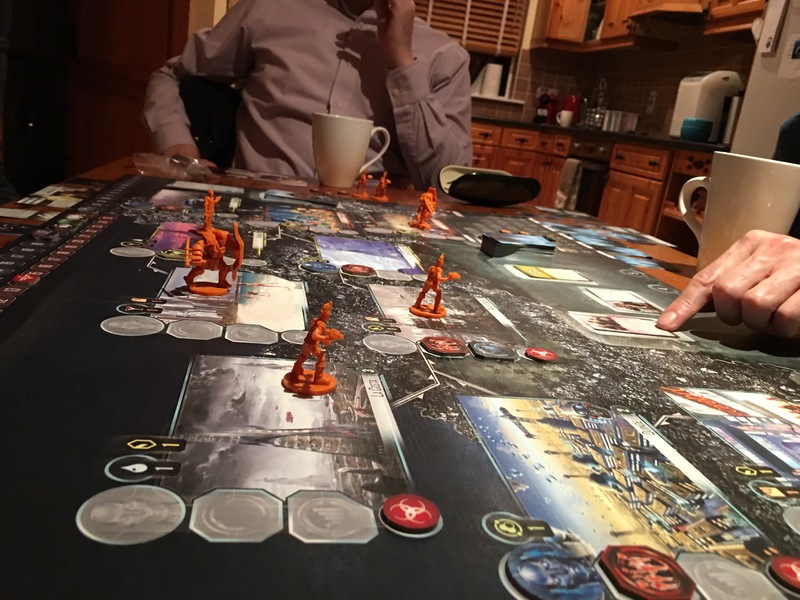 Each player takes the role of a powerful Mega Corporation all of which will be familiar to anyone who have played in the Android universe before. The corporations are all working together like ebony and ivory to give the people what they demand in the form of tech, entertainment, and four other resources I can’t recall the name of. Doesn’t matter what they are. You flip a demand card three times in the course of the game and the people suddenly want various quantities of different resources (the feckless rogues) and it’s up to all of you in two turns to give them want they want or face the ire of the government. Ire it seems can be quantified. The government is keeping New Angeles under its Sauronlike gaze. If the corporations working together can keep the people happy then they too are happy, but if they fail to match the people’s wants the group incurs threat points and if it reaches 25 EVERYONE loses. Other things each turn like unchecked disease and crime earns you threats. It’s all too easy to gain these and extremely hard to reduce them so it’s a race to get to the end of turn six before the bottom falls out of your gravy train world. Obviously I wouldn’t be talking so excitedly about a game if it was pure coop. It’s not. At the start each player draws a secret rival card. Your goal apart from having everyone win is to have higher capital than your secretly drawn opponent. So it’s a case of a number of of people could potentially win but there’s going to be some really bad losers. Now. Add to this one of the rival cards is actually a traitor card and that player is now secretly working for the government and wants the threat to get to 25 and everyone to lose, in which case they win, you’ve got a tasty paranoid meaty stew with secret agenda lumps glistening under the bubbling surface. 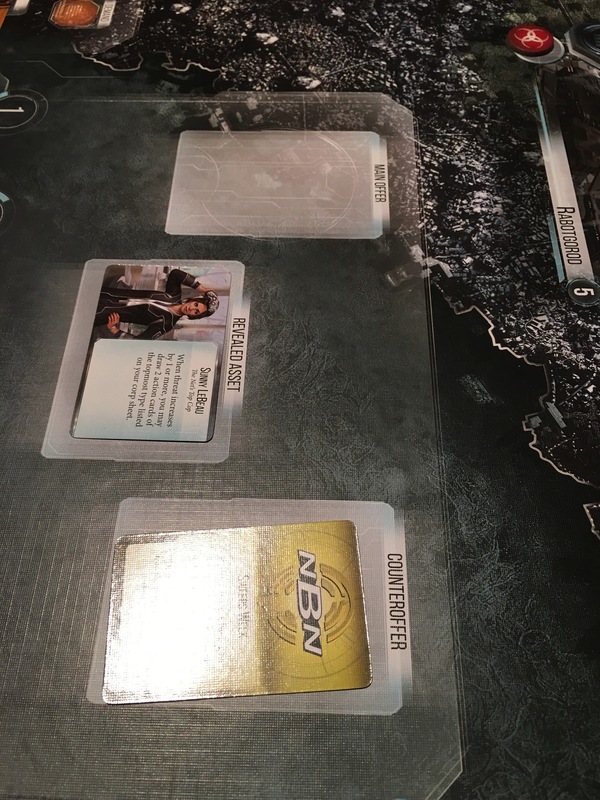 The game plays out by the rotating active player putting forward a proposal card to fix or improve something in one of the ten sectors of the city. Another player may put a counter proposal card in place and everyone abstains or throws a number of limited action cards in to vote for one or the other. The winner gains an asset as a result that will give him some plus or bonus later on and may well benefit from the proposal in terms of more capital (both your gold and your score). What’s really thematic here is someone could play a proposal card that stamps out crime in two sectors which would be very laudable if they didn’t control private security and made capital like a bandit from the action. Worse still it might be a case you can’t ignore crime any longer so you all willingly have to make it happen. Everyone has an angle in this game. Players also draw a secret agenda card at the start of the demand arc that benefits them if certain things happen when demand is fulfilled, like ensuring there’s a certain amount of outages in the city, the police are out in force and so on. 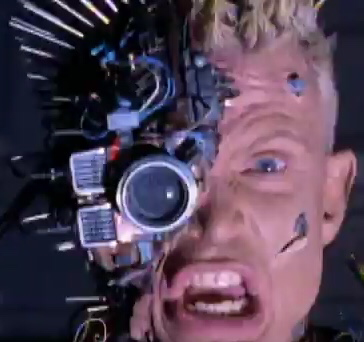 It’s entirely believable and if it wasn’t a cyberpunk setting you could certainly see players all dressed in stovepipe hats waxing their villain mustaches and grinning manically and most certainly not being able to comment on their motivations. The game is surprisingly fast. It’s only 6 turns. Even with a full compliment of six and all new to the game it took a little under 3 hours to finish and everyone wanted badly to see how it finished. In our case the traitor slipped the clutch on the very last action and won it for himself. Damn government. There’s a lovely plate spinning mechanic going on here. Each of the various corps specialize in things like medicine, law enforcement, repair and construction and they benefit in capital when these actions happen in the city. Ignore a particular area like health completely and it goes from a headache to a migraine which will cost everyone the game. Deals are a big part of the game to get your agendas over the line as is backstabbing and general caddish behavior. It’s wonderful. Something I’ve heard from a number of sources is this is like a new version of Battlestar. Absolutely not. It’s a very different beast (Battlestar rocks btw). 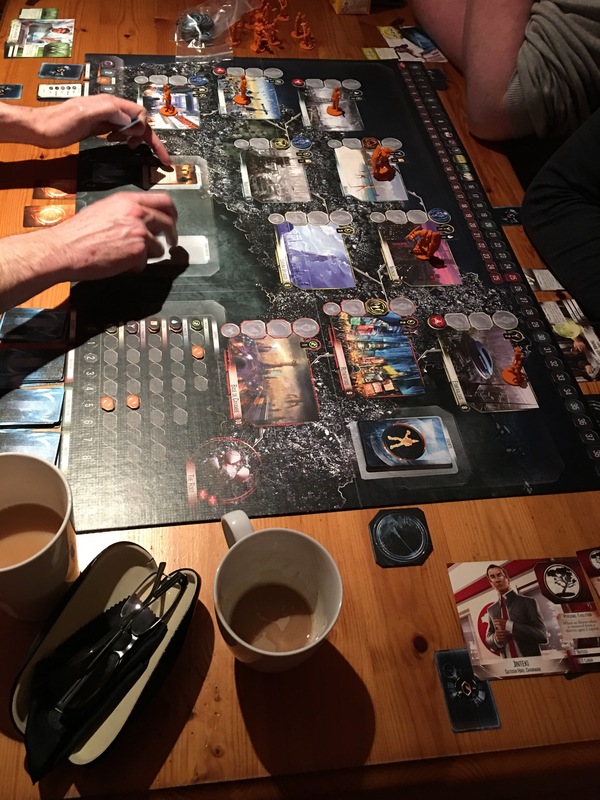 While it does have a whiff of Battlestar it also has a whiff (as opposed to a pong) of XCOM and maybe a dash of the original Android board game. It’s very much it’s own unique self and I love the unlikely allies mechanic in the game very much. Production values are excellent as always from Fantasy Flight. Good artwork. Nice minis, everything you’d expect. The action cards a little small and the card type is tiny and hard to make out but that’s more my issue than the games. So far I’m loving this and it’s shot in straight away as one of my top games alongside Battlestar and Imperial 2030.